Do you want to have an amazing Thanksgiving celebration? You need to make this pie. THIS will make your celebration fabulous. I’m not lying. I made this pie. I had a fabulous celebration. Seriously, this pie has a bit of everything for everyone. 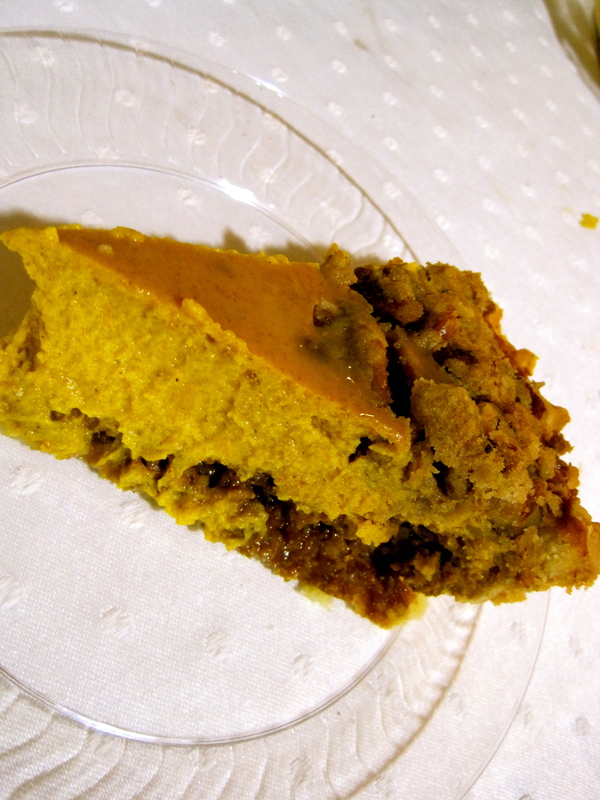 It has a buttery, flaky bottom crust which is then topped with a spicy gingersnap crumb crust. 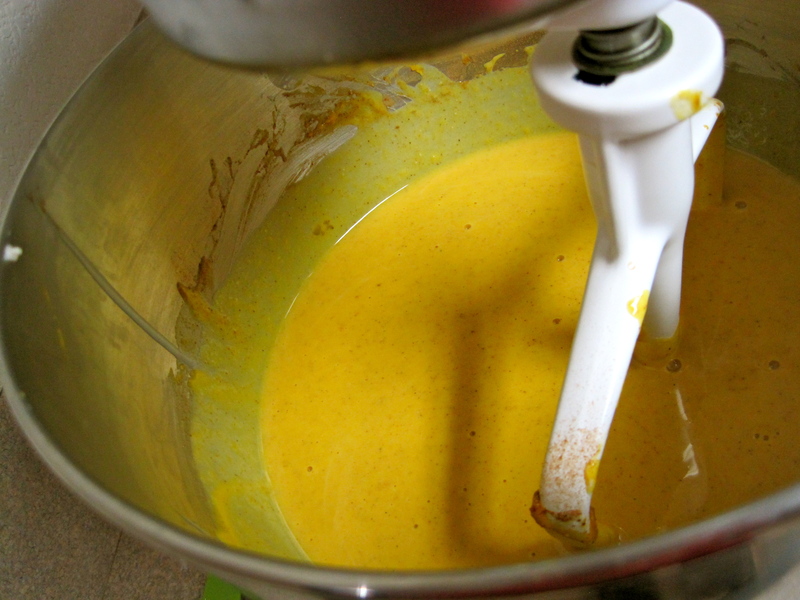 After that, a rich, creamy pumpkin filling is poured on top. Finally, a crunchy and sweet pecan streusel finishes the entire pie. L.O.V.E. I would have to say that this is probably the best pumpkin pie that I have ever had. By the end of the evening, there was only 1/7 or so of the pie remaining. Considering I had also made an entire dinner with several sides and two other desserts, I think that says a lot. Look at that double crust marriage of awesomeness, seriously. I’m going to admit something. I cheated a little. The crust is thawed, rolled into a pie dish, and then poked with a fork so that when it bakes, it doesn’t puff up. If it does puff after baking, you can poke it with your fork because it is still pretty malleable. The pumpkin filling is both creamy and rich. It has a bit of spice, a bit of sweetness, and all of the flavors of Fall. I will admit that I was a little intimidated by this pie. Especially when I went to pour the pumpkin filling into the crust. It didn’t seem like it would fit, but somehow, it did. 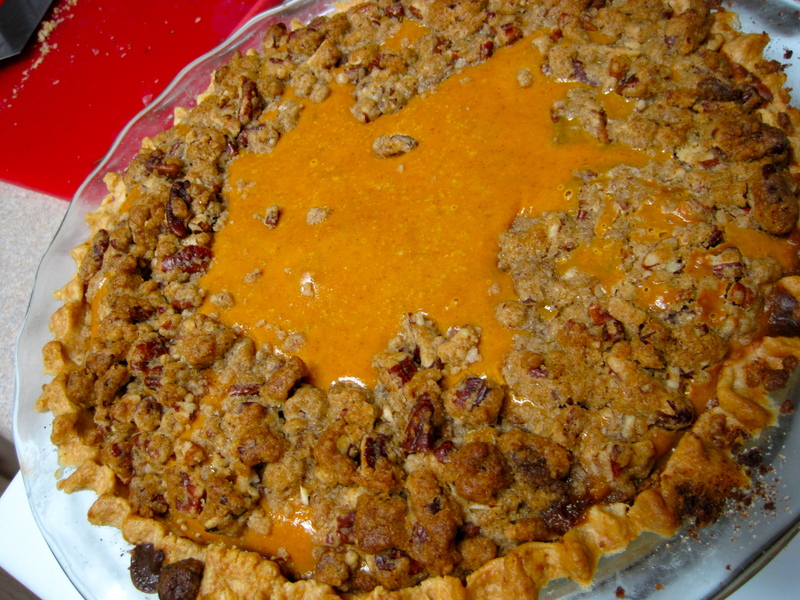 Pecan topping takes this pie over the edge. True story people. 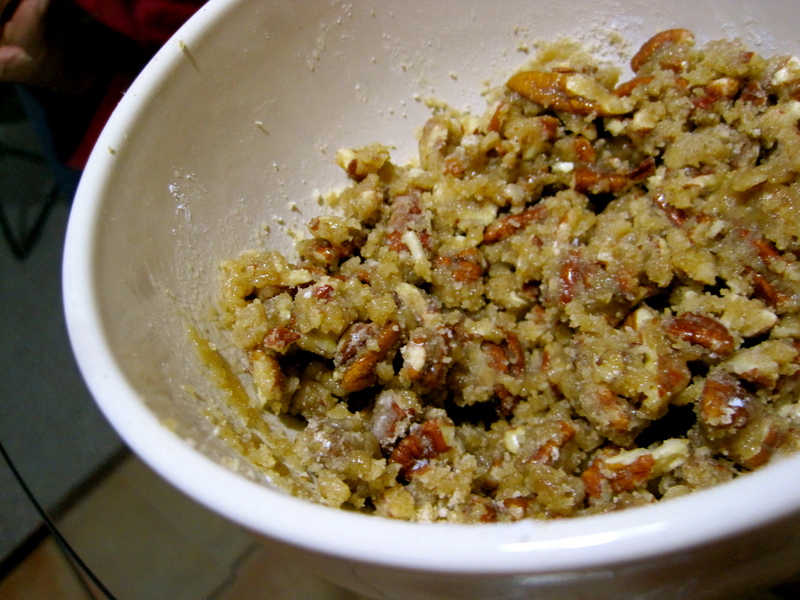 Half way through the baking process, the pecan topping is added to the pie. It’s popped back into the oven for another 40 minutes to explode with love and flavor. This really does happen in your oven, you just have to make sure to leave it closed the WHOLE time. The hardest part of making the entire pie? Waiting for it to cool so I could gobble it all up. You already have your pumpkin pie recipe for Thanksgiving? Forget it. Make this. With love. Roll thawed pie crust into a 9 inch pie dish (my was regular, not deep dish). Crimp edges with fork or fingers. Poke pie crust with a fork. Set aside. 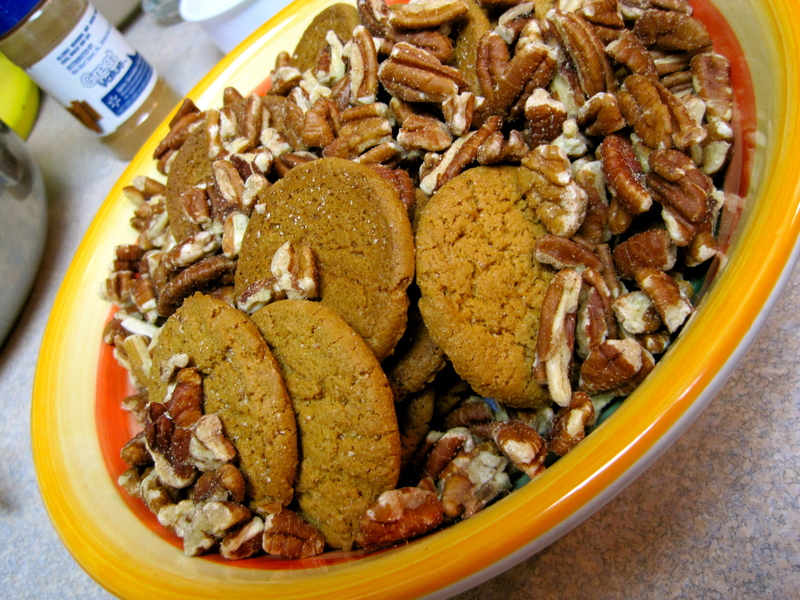 In a food processor, grind gingersnaps and pecans until pulverized (good word, right?) Add sugar and cornstarch and process again until combined. Drizzle in butter and combine. Press gingersnap crust into dough crust about halfway up. There will be quite a bit of the gingersnap crust. Don’t fret, everything will fit. Pour the filling into the pre-baked crust. Cover the crust edges with foil or a crust guard thingie (yes, it’s very technical) and bake for 30 minutes (still at 350 degrees F). 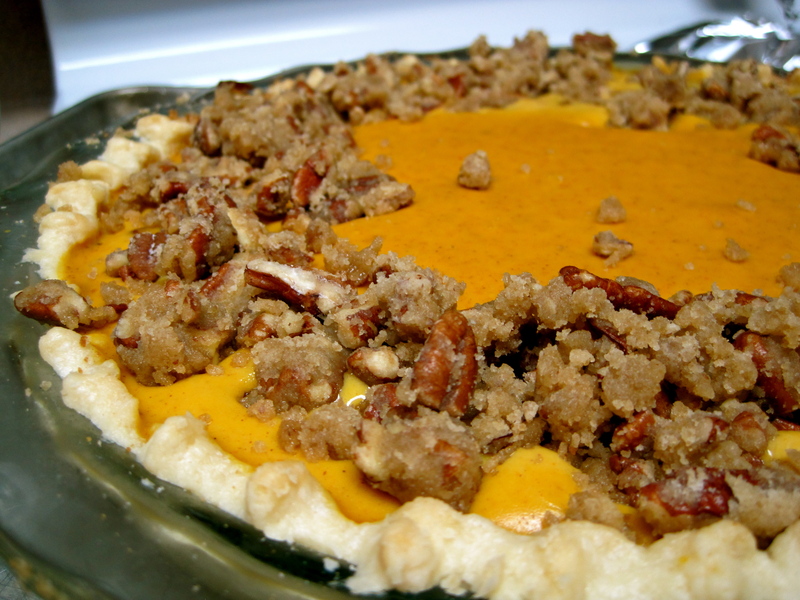 Remove the pie from the oven and add the pecan streusel (recipe follows). Bake for an additional 40 minutes. Let pie cool for 1 hour. Devour. Refrigerate leftovers, but I doubt you’ll have any. Combine all ingredients in a small bowl. 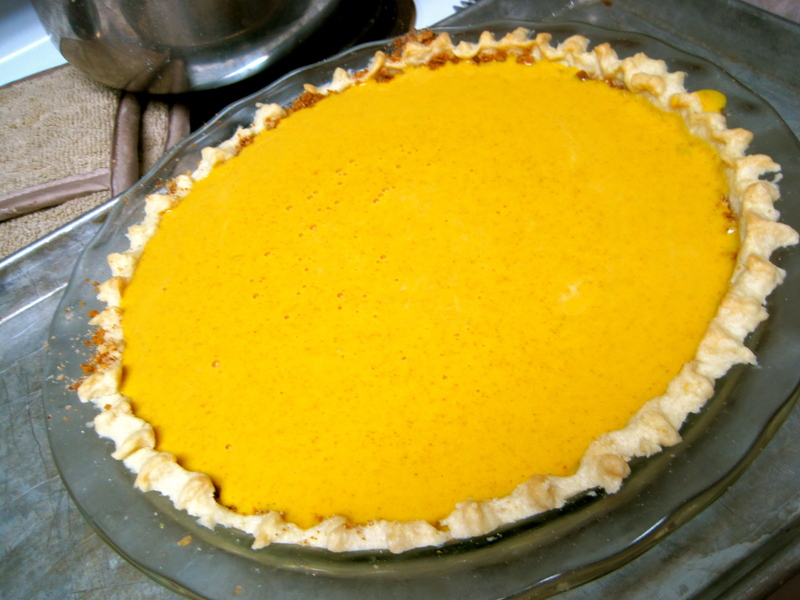 Sprinkle around the outside edges of the top of the pie. That was a gorgeous and delicious pie! Thank you! I’m so happy you loved it! I made the pumpkin and gingersnap, and pecan streusel pie and I have to tell you that you were right on the money with this one. It was perhaps the best pumpkin pie I have ever eaten and ever made. I only made some slight changes like adding the extra egg yolk and not using all of the gingersnap crust. Other than that I stuck to what you said to do. Absolutely divine…and so much fun too! I’m so glad you liked it! The extra big of egg makes it more fluffy right? I’m sad that there isn’t anymore left for me to eat. I may have to make it again!